During the 1950's George Turner began research on A. C. Kline as the identity of John William Kline. He died before publishing his landmark article "John William Kline: America's First Philatelic Author". His work was completed by Herbert A. Trenchard who years later published this article as a joint author in Philatelic Literature Review, Vol. 42, No. 1, Whole No. 158, 1st Quarter, 1993. This biography is dedicated to George Turner and Herbert A. Trenchard, true gentlemen in the best sense, for their dedication to original research, honor and integrity. quartered cork killer. Ex-Rumsey Sale #82, lot 3490 Realized $450 + 20% commission = $540. A. C. Kline is purported to have been the pseudonym of John W. Kline and that the two have been thought to be one in the same person since 1868 due to an ill informed rumor first propagated by Joseph N. T. Levick, who kicked up a breeze in The American Journal of Numismatics, Vol. III, No. 6, October 1868 (page 47), and later on in 1876 when E. J. Attinelli published this conflation of personae in Numisgraphics on page 60, but with a new twist. Attinelli put it right giving it a new spin on the Levick rumor distinguishing between Mr. & Mrs. Kline, (something not even alluded to by Levick, who never mentions a spouse of Kline), explaining that Mr. Kline used his wife's identity when in "pecuniary troubles", i. e., financial difficulty. That is an enormously odd thing to say about someone still living -- leaving one with the impression he was like Dicken's Jack Dawkins better known as the "Artful Dodger," a skilled thief, avoiding bill collectors and generating bad debt. This we shall return to shortly below, but first, let us look at the survey of literature that has dealt with this muddled identity. The most informative study ever published on this was by George Turner and Herbert A. Trenchard, "John William Kline: America's First Philatelic Author" Philatelic Literature Review, Vol. 42, No. 1, Whole No. 158, 1st Quarter (1993) : 24-41. Four and a half years later Joel J. Orosz, repeating most of what had already been published earlier by Turner & Trenchard, published his study The Curious Case of the Coin Collectors Kline (Bowers & Merena Galleries, Inc., August, 1997). At the current state of the research John N. Lupia III, has definitively established that a woman with the identity of Mrs. A. C. Kline as the wife of John W. Kline is conclusive and is certain. This was the original flaw to the work of Turner & Trenchard who did not investigate enough to prove the actual existence of Mrs. A. C. Kline but continued to build on conjecture and hearsay from antique contemporary sources (mainly Attinelli) as though it was fact but without any hard factual historical evidence to support it. The same is true when Joel J. Orosz published his book basing his thesis on the earlier work of Turner & Trenchard but neither checked the sources nor provided the missing evidence, something that should have been done from the outset. Credit must here be given to Mrs. Kay Olson Freeman who found some records in Philadelphia that tell us Mrs. A. C. Kline’s first name is Adelia with a middle initial C. Her research also helped me avoid a few pitfalls in attempting to reconstruct a biography of the mysterious Klines. This has all been cleared up rather nicely with the discovery of Lupia’s findings and the additional work of Freeman. This certainty of identification of a Mrs. A. C. Kline was first based on interesting anecdotes published in the Philadelphia Inquirer March 21, 1878, which tells the story of John W. Kline, who was arrested in March 1878 because he passed a forged judgment note dated January 12, 1877 purportedly signed by himself and his wife A. C. Kline and witnessed by David C. Wilson, a lad. The note was forged for a $300 loan from Edward V. Lansdale of 52 North 13th Street Philadelphia who later on discovered he was hoodwinked. The verdict in the case was against John W. Kline who was held on $2,500 bail. The following week the story ran about the case being moved up the ranks to a grand jury hearing and how Mrs. A. C. Kline refused to sign the note and John W. Kline forged her signature. The boy Wilson swore he never saw Mrs. Kline sign the note. The guilt of John W. Kline was obviated by the fact he used a minor as a legal witness to a signature that was forged without either his wife or the boy in his legal minority having known what he had done. At a hearing in April 1878 Lansdale testified that John W. Kline the realtor presented the note to secure a loan for $300. In the testimony "Mrs. Kline said she would not sign the note; that her husband had told her that he would leave her if she would not do it, and she replied that if the signing of the note was to be the price of his remaining with her he could go for all she cared." A niece of Mrs. Kline was called and she testified the signature did not have the appearance of having been written by her aunt. The matter was held under advisement. Returning to Attinelli's earlier comment that makes John W. Kline sound like the "Artful Dodger," in hindsight it seems clear what he was alluding to, but he wrote that comment two years prior to the case of 1878 which tells us at least one more similar event must have occurred prior to 1876 which he was aware of that led him to make such an outlandish comment about someone still living with no fear of libel. We shall also learn as our story unfolds that Mrs. Adelia C. Kline was no innocent as the newspaper story suggests. Although John W. Kline's wife bears the name “A. C. Kline” it does not necessarily defend and support the theory that the coin auction sold in June 1855 belonged to anyone named “A. C. Kline” or that it belonged to Mr. & Mrs. John W. Kline. This important matter we shall return to below. What the court case in 1878 reveals is that John W. Kline was a conniving schemer who practiced duplicity whenever he was involved in what Attinelli politely referred to as his "pecuniary troubles". Apparently, Mr. John William Kline (if that really was his name) was a criminal genius who knew every angle to gyp and weasel his way out of debt and cheat and swindle through fraud. The December 1880 issue of Mason's Coin Collectors Herald contained, on p. 22, the punning headline: "Coin Business Declined." The text underneath read: "A.C. Kline, who with Edward Cogan and E. Mason, Jr. formed the three coin dealers in 1860, in this city, has stepped 'down and out' and his well known shop on 13th Street is closed. Alas for "Wm. John," alias A.C.K.," who might have been at the head and front, if--concluded in our next." Mason tells us that John William Kline is to the best of his knowledge William John Kline. It is impossible to believe that Mason was a close friend of John W. Kline. 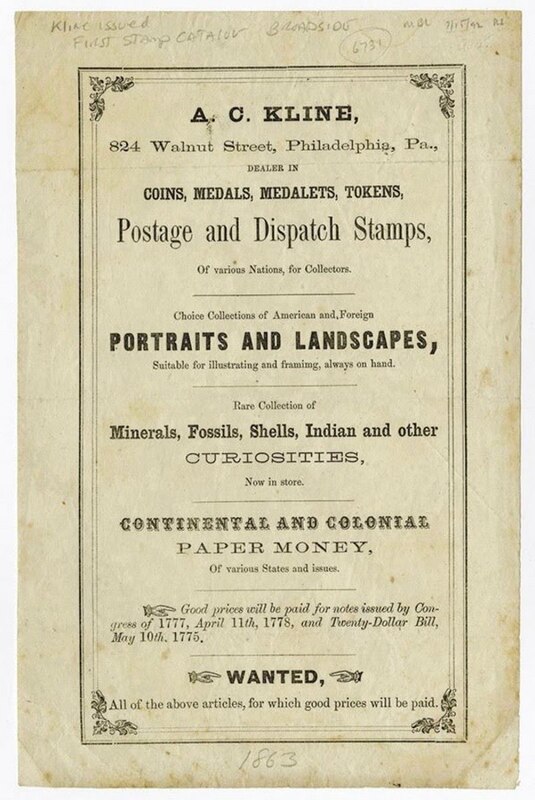 From his very first issue of his magazine published in April 1867 Mason reports "Mr. A. C. Kline, of Philadelphia, is believed to be the first collector who sold, by public auction, a good assortment of the coins of America." Mason's Coin and Stamp Collector's Magazine, April (1867) : 3. There is great difficulty in accepting their presumed friendship when Mason very apparently does not know his real name. This too is aggravated by Mason who says, “C. & H. Gloyn, Manchester, Eng.—Yours at hand. Can you use the old issue U. S. cancelled 1 c., and 3. stamps? Delivered the note to A. C. K. “ Mason’s Coin and Stamp Collector’s Magazine, Vol. I, No. 5, August (1867) : 45d. Did he really deliver the note and chat with him calling the man Mr. A. C. Kline and J. W. Kline nodded accepting the false identity and perpetuated it for many years? And this continued on for many many years and finally Mason calls him 13 years later Mr. William John, as if he had some inside secret. The whole of it is a riddle wrapped in a mystery inside an enigma. One of the central items of our investigation to learn about the historical personalities of the Klines is the famous auction catalogue of June 12-13, 1855.
, 100p. ; 26 cm. "This collection is particularly rich in choice gold and silver, of the American and Roman series, many of which are in a high state of preservation, and of great rarity. The series of Roman coins, in particular, may be considered the most extensive, rare, and valuable, ever offered at public sale in this country. The series of American coins are very rich in proofs, and the copper are particularly fine. A fine collection of medals, and numismatic works--many of which are exceedingly rare. To be sold at public sale, on Tuesday and Wednesday, June 12th and 13th, 1855, (morning and evening,) commencing at ten o'clock, each day." merchant and auction dealer living in Philadelphia since at least December 1817. Augustus B. Sage in his catalogue of the Henry Bogert sale, February 28, 1859, lists lot "1638 KLINE. Catalogue of collection sold in Philadelphia 1854. Unpriced." This appears to have initiated identifying the sale of June 1855 as the Kline sale although cited as 1854 by Sage. Though a collection was sold in 1854 in Philadelphia identified by Sage as Kline it only aggravates the problem as to which Kline?, which collection?, and regardless it was assigned a different date, not 1855. Moreover, we find Charles I. Bushnell in his classic, An Arrangement of Tokens, etc., also identifies the auction of "Franklin Token by Bale." and Feuchtwanger's Cent and three Charles Wilson Peale Museum store cards were sold in the 1855 auction of J. W. Kline and lists the respective buyers as Howard, Benners, Kellertine, Wethers, Shultz, Burtus and Bushnell. Where he identifies himself as the buyer of the Charles Wilson Peale Museum silver store card purchased at the price of 88 cents. Bushnell published this list in 1858. By 1859 A.C. Kline had been in business two years as a coin and curio dealer at Philadelphia. Whereas, Sage might have been the first to have assumed it was A.C. Kline and was the first to make that attribution. What is even more curious is the fact that Sage in the Bogert Sale list in lot 1639 the Flandin catalogue that is bound with a Philadelphia sale in 1855 left anonymous. Was Bushnell present at the June 1855 sale in Philadelphia and knew directly the owner being J. W. Kline, or did he bid through an agent and learn by hearsay that the owner was J. W. Kline. It seems that by 1858 there was a muddled confusion about the identity of the owner of the collection. One attributing it to J. W. Kline and another to A. C. Kline, and the later on another occasion leaving the owner anonymous. Regardless, one wonders how the Klines from about 1853? to June 1855 could have afforded to purchase all of these very rare, and valuable coins, something that only the upper middle class or upper class could afford to do? We shall learn how Mrs. Adelia C. Kline perpetuated the rumor that the June 1855 auction catalogue was hers in her auction catalogue of 1866. Daniel Parish reading her 1866 coin auction catalog lot 635 description attempted to figure out the name of Mr. Kline. That Mason getting wind of both sources asserts A. C. Kline was the first important collector and auction sale in America initiating the A. C. Kline hoax. Levick hearing of all three stories published in October 1868 a distilled version of it in The American Journal of Numismatics. And, E. J. Attinelli many years later inheriting the muddled mess attempts to unravel the mystery inside the enigma in Numisgraphics. So who was the owner of that coin collection sold in June 1855? Was it really “A. C. Kline” published on the title page of the printed catalogue? Was a local dealer by the name A.C. Kline taking orders for bids at the sale published on that title page? I have never seen the catalogue but get the gist from Turner & Trenchard that no name of any owner appears on it. Dave Bowers in his classic work American Numismatics Before the Civil War (page 48) says something more decisive "The 92-page catalogue did not mention the owner's name." This is something very typical. The first identification of the owner as a person named Kline was found in lot 635 "Kline's June 1855 Thomas Birch & Sons" coin auction sale found in a collection of 690 lots sold through Thomas Birch & Co., on April 16, 1866. The auction catalogue typically does not give the name of the consignor on it also. Two coin dealers are listed on the front cover of that 1866 auction catalogue taking orders, i.e., bids for the sale, A. C. Kline and C. K. Warner. This coin auction sale is never mentioned in the list of coin auction catalogues published by Daniel Parish, Jr. in 1866. The identity of the consignor of this 1866 sale was given by Attinelli in 1876 as A. C. Kline and that identification appears to be very reasonable and tenable. The question is, who was Mrs. Kline identifying as the owner of the June 1855 coin auction sale when she wrote the description in lot 635. "Kline's June 1855? Was she referring to herself, her husband, her father-in-law, a completely different Kline unrelated or a distant relative, who? Or was she pirating the identity as she has so skillfully pirated so many other works several years earlier? Daniel Parish, Jr. owner of the largest collection of coin auction catalogues in the United States had identified this person four months later as F. J. Kline in his list as entry #15 published in 1866. Fig. 1. A. C. Kline Photo no. 48 taken from the plate "Numismatic Photographic Gallery" published by Ebenezer Locke Mason, Jr., in March 1868. Please note Ebenezer Locke Mason, Jr. does not label the identity of the man in this photo as John W. Kline, and Mason was an old chum of Joseph N. T. Levick since at least 1855, who just six months after this photo was published began the rumor in The American Journal of Numismatics that A. C. Kline and John W. Kline are believed to be one and the same person, apparently based onMason's Magazine of April 1867. [The key to the argument is obscured by the circularity of information exchange making it tough to follow and apparently has eluded most.] Also, this was almost two years after Mrs. A. C. Kline’s auction held in April 1866 not far from Mason who lived in Philadelphia. She had been coin dealing at Philadelphia since 1862. Did Mason know this person in the photo or the owner of the auctions in 1855 or 1866 identified as belonging to [Mrs.] A. C. Kline before he published the photo? Did Mason know Mrs. A. C. Kline? The answer is obviously, No! Moreover, in 1880, Mason says A. C. Kline is the alias of “Wm. John” not John William Kline. The fact that Mason mentions for the very first John W. Kline as late as September 1871 after exclusively citing A. C. Kline since 1867, also tells us that Mason did not know the identity of Kline or that it was being muddled or conflated or that there was any alias or pseudonym at the time. We learn in hindsight that it was Mason who actually began assigning the June 1855 catalogue to A. C. Kline and is, consequently, at the center and cause of the whole identification fiasco, and the rest is history. A. C. Kline, or F. J. Kline (? ), or Mrs. A. C. Kline, or John W. Kline? or No Kline at all? It is not clear who the owner of the coin and medal collection was comprising an extensive assortment of 1,854 lots of American coins, in a public auction on June 12, 1855, at the auction house of Moses Thomas & Sons, Philadelphia, Pennsylvania, realizing a total of $2,062.80. The question arises “How could either Adelia C. Kline or her husband John William Kline have amassed such a valuable collection of Siege pieces, foreign and American coins and medals, foreign and American gold and numismatic literature for “the largest coin auction held in the United States up to that time [? my question]. . . . Although Kline’s name is not mentioned in the catalogue, Attinelli states that “A. C. Kline” was the owner.” (Trenchard & Turner, 27). The first person to assign the sale to Kline was Sage but gave the year a`s 1854 which might be a different sale altogether. This may have been the catalyst that set off the second numismatist to identify the owner’s identification was Daniel Parish, Jr., who in August 1866 gave the name of the owner in #15 of his list as F. J. Kline (originally described as 2,052 pieces with prices given as $10 less than Attinelli published a decade later). Daniel Parish, Jr., published a series of three articles from August-October 1866 in The American Journal of Numismatics that formed the base of what E. J. Attinelli would revise and publish a decade later in Numisgraphics (1876). This is the 27th coin auction listed in Attinelli, Numisgraphics on page 11, which he revises to read A. C. Kline indicating Mrs. Adelia C. Kline. But, was Attinelli being objective revising the name first published by Parish in 1866 from F. J. Kline to A. C. Kline or was he influenced by another source? As we have already seen Joseph N. T. Levick began the revision of that identification in 1868 two years after Parish published F. J. Kline in 1866 and Levick's revision undoubtedly colored Attinelli's view when he published in 1876. Although Levick cites John W. Kline as the owner of the 1855 auction in 1868, Attinelli changes the name to A. C. Kline on page 11 and goes into his explanation on page 60 at which point he says the 1855 sale was that of John W. Kline. But who was the real owner of that June 1855 collection? -- F. J. Kline, A. C. Kline, Adelia C. Kline and/or John W. Kline or was it someone else? The identity of that owner is reflected in the coins. That collection assembled and sold in June 1855 was accomplished by an upper class connoisseur who gather many fine gold coins and rare Siege pieces indicating a very astute and wealthy collector of distinction. There are two interesting questions surrounding this 1855 collection if it indeed belonged to Adelia C. and John W. Kline. First, how could the Kline's afford to hoard a large amount of money even at face value for people in their lower socio-economic and income class? Second, we already know that Adelia and John Kline are dishonest (she a plagiarist and he a fraud) and if they really had been the owners of that 1855 collection at auction why not change their advertising in the 1860's and 1870's to read established 1855 or 1854 or even earlier (most collectors know it takes about two years or more to amass a significant collection as that sold in 1855) rather than 1857 -- since from 1868 on (thanks to Levick) they could have convinced everyone that the 1855 collection was theirs even if it wasn't? "So far, no written information has been found for the years 1857 to 1860." (Turner & Trenchard 27). This fact only aggravates the difficulty of assigning that 1855 collection to Mrs. A. C. Kline. But what did Levick base his October 1868 opinion on? Well, he published the verdict about A. C. and J. W. Kline in October 1868, which was nearly two and a half years after Mrs. A. C. Kline sold her collection of 690 lots through Thomas Birch & Co., on April 16, 1866 noting that the 1855 catalogue was Kline's. It was certainly after this time that Levick began to misidentify Mrs. A. C. Kline (who is Adelia C. Kline, wife of John W. Kline) as a pseudonym of John W. Kline. This smacks of Mason's Magazine's influence on his thinking. Oddly, Parish has no listing of this auction in his splendid and comprehensive list. Levick was at New York and attended the regular meeting of the American Numismatic and Archaeological Society on April 12th, and again on April 26, 1866. Perhaps some researcher has a priced and named catalogue of the April 16, 1866 sale that lists Levick among the buyers. But Mrs. A. C. Kline was dealing coins since 1862 while John W. Kline seems to have been away at military service during the Civil War making her, not her husband the dealer who established the first American Philatelic manual and was selling coins, medals, tokens and store cards, rare books, antique engravings, colonial paper money, autographs, stamps, minerals, fossils, shells, birds eggs, rare china, Indian relics, curiosities and so forth. She also went on to publish price lists throughout 1864. But was she collecting coins amassing a huge collection long before June 1855 or has that catalogue been long misidentified assigned to the wrong Kline or wrong person altogether? Levick too was away during the Civil War but could have learned about Mrs. Kline's coin dealership after returning to civilian life. But he obviously did not since he does not distinguish between Mr. & Mrs. Kline but conflates them as if they were one and the same person and that person according to Levick is exclusively male, i. e., John W. Kline. 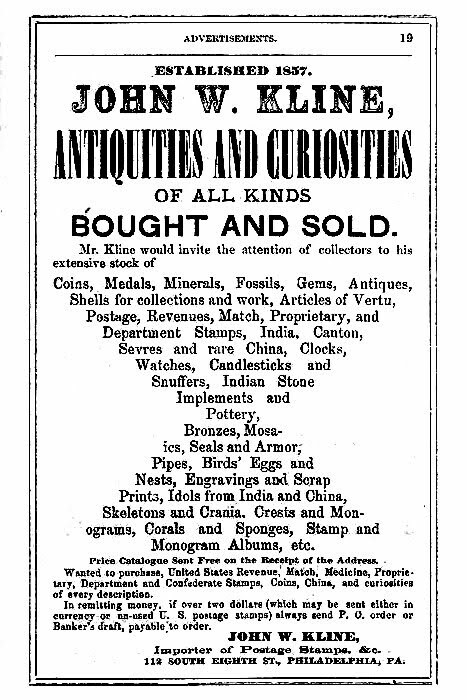 Much later on John W. Kline purports that in 1857 he became a Philadelphia coin, medal, stamp, mineral, fossil, shell, Continental paper money, antiques, engravings, idols, furniture, fine china, birds, eggs, and curiosities dealer in his shop at 824 Walnut Street. But we have already seen that Turner & Trenchard have found no evidence of the veracity of that claim. In McElroy’s, Philadelphia Directory for 1861, there are two listings : A. C. Kline : Stationery, etc. 824 Walnut. H. 406 Prune; and J. William Kline : Periodicals, 406 Prune, clearly revealing that these are two different people not one and the same as Levick purported to be the case in October 1868. Yet Turner & Trenchard suggest John W. Kline was engaged in military service and was away during the Civil War, serving as a Colonel, a suggestion that helps explain the evidence from 1861-1865. During that time it is obviously Mrs. Adelia C. Kline, who printed The Stamp Collector's Manual in December 1862 and the following year is listed as A. C. Kline "Coin Dealer" in the 1863 Philadelphia Directory . She was evidently both a stamp and coin dealer on her own right with no help from John W. Kline. Her husband may have hidden behind her apron strings to avoid responsibility to debts but they were two distinct separate dealers active in the coin trade from the 1860's on. Up until this time at the outbreak of the Civil War it appears that Mrs. Adelia Kline alone was the coin and stamp dealer since her husband was a realtor who went off to war. Sometime after the Civil War is the earliest timeframe when John W. Kline enters the coin and stamp trade, and the rest is history. During the Civil War during her husband's absence Mrs. A. C. Kline began to publish The Stamp Collector’s Manual, which she pirated from Mount Brown’s, Catalogue of British, Colonial, and Foreign Postage Stamps (London, 1862), adding some additional original material, especially on C. S. A. and U. S. stamps, in December 1862, under the name A. C. Kline. This was the first American philatelic publication, though a line-for-line plagiarism it was published in three editions from 1862 to 1865, with the second edition plagiarizing the work of Dr. Gray. How did Adelia C. Kline get a copy of Mount Brown’s catalogue from London published in May 1862 and be able to plagiarize it into print under her name by December of that year? We know she did. But, how? Did someone bring her a copy on a voyage from London to Philadelphia? Was there a book dealer who received a recent shipment of books from London, and she bought the copy using it as her template? Also, in 1862, she published two works : Henry Philips (1838-1895), An historical sketch of the paper money issued by Pennsylvania : together with a complete list of all the dates, issues, amounts, denominations, and signers; also, A Catalogue of the New Jersey Bills of Credit, comprising their amounts, denominations, and the names of the persons appointed to sign them, from 1723 to 1786. By Henry Phillips, author of the Pennsylvania Paper Money. (Philadelphia: A. C. Kline. 1863); and reprinted the 1843 edition of Samuel Breck’s (1771-1862), Historical Sketch of Continental Paper Money. In July 1863 she ran a small ad selling Coins and Medals in the West Philadelphia Hospital Register. She was active in the Great Central Fair at Philadelphia in June 1864. Also in 1864 she issued another pirated work,Unused Despatch and Express Stamps, originally published by George A. Hussey of New York, and her own Price Catalogue of American and Foreign Postage Stamps. In 1865 her establishment was called Kline’s Emporium with the advertisement stating it was established in 1857. A. C. Kline 1863 broadside. Courtesy the Lupia Numismatic Library. Ex John E. Herzog Collection. In 1868 they moved their shop to 212 South 8th Street, Philadelphia. In 1869, John W. Kline’s photograph is published as figure 48 in Mason’s Photographic Gallery of the Coin Collectors of the United States No. 1, but labeled A. C. Kline. That same year he published the Simms Catalogue. John William Kline, Jr., (1824-1892), he reportedly was born October 19, 1824 at Philadelphia, Pennsylvania. John W. Kline, Jr. emerges on the scene listed among the Philadelphians in a town meeting in 1849 published in the Philadelphia Inquirer, May 1. As his name implies his father was also named John W. Kline, but no genealogical evidence has yet been found to confirm this. Later on he placed several advertisements for real estate sales and rentals giving his address as the realtor at 98 Franklin Street, Philadelphia in 1855. He did not make a lot of money in 1855. He was renting three-story brick buildings for $10 per month rent. It seems virtually unthinkable that the splendid collection of coins auctioned in June could have belonged to this poor realtor. There is no documentary evidence to support Mr. Kline having married Adelia. C. to be Mrs. A. C. Kline prior to 1860, which is absolutely necessary to support the assertion that the 1855 coin auction to have been hers. But even if this could be shown that they were married before 1855 it still does not prove she was the collection owner. Further evidence would be required to confirm that identity. But in lieu of contradictory evidence already shown here thus far any effort would seem to be in vain. To begin with they were fairly poor and as a married couple lived with Adelia's parents at 406 Prune Street , not at 98 Franklin Street, Philadelphia, which is John W. Kline's address at that time. This, of course, aggravates the difficulty and produces an insurmountable hurdle of how this lower income couple could afford to hoard away such a large amount of money in collectible specie, besides owning very rare Roman coins and proofs, and so forth. Then there's the incredible witness of bad moral character one needs to overcome, namely Adelia's word that the June 1855 catalogue is Kline's. Then there's the difficulty of 1855 vs. 1857 when they entered the coin business, which gives away the whole of it as a fib. Taking a closer look at that sale the catalogue contained 101 pages listing 1854 lots that realized $2,062.80 (averaging $1.11.26 per coin). That was a very impressive sale and average coin price back in 1855. We do not see [another] A. C. Kline consignment at auction for another nine years, i.e., April 16, 1866. Nothing odd in that if she were actually the owner of the first one in 1855. But what is a bit odd is the character and quality of that second sale in comparison, only 37% the size of the previous sale, with no prices realized by Attinelli. Lupia’s copy has no prices to calculate that total. But wait! It gets worse. Of the 690 lots 217 lots are literature and curiosities, leaving only 473 coins and medals in that collection. One can immediately see there is no intelligent comparison between these two sales since they are inherently incomparable one to the other. The quality of the coins is inferior to the sale of 1855 as if a completely different personality were involved in its arrangement, description and sale compared to that of 1855. Four and a half years later we find on October19, 1870 the first John W. Kline collection being sold of 378 lots sold at Bangs, Merwin & Co., New York, that realized $333.53. That was a fairly substantial average for any coin sale at this time averaging $0.88.23 per coin. This appears to be the time when John W. Kline took on a real role in his wife’s coin and stamp business perhaps as early as 1866. Joseph N. T. Levick voiced the opinion that "John W. Kline (believed by most to be A. C. Kline)" as early as October 1868 in The American Journal of Numismatics, detracts from Mrs. Adelia C. Kline, who was the first great American philatelist and numismatist and coin auction cataloger, and unfortunately as crooked as her husband. If this interpretation is correct then it was probably around the time of the 1866 sale that John W. Kline usurped his wife’s identity and Levick got wind of it believing like most that he was the only A. C. Kline all along. It appears that John W. Kline engaged in identity theft long before it became a social concern, and his wife seems to have beat him to it several years earlier. This can be further corroborated by looking at his advertisement in Punch and Judy, 1874, where he alleges he established his shop in 1857. Liars always make mistakes and the glaring mistake is 1855 vs. 1857. Whether it was his wife or himself who established the shop in 1857 is irrelevant since it happened two years after the sale, not two years before the sale. What an evil web we weave when at first we begin to deceive. Alas! That same year an interview with John W. Kline was published in "Rare Collection of Curiosities from Every Part of the World," The Philadelphia Commercial and Manufacturer's Gazette, June 27, 1874, which purports the same that he established his store in 1857. Moreover, on another possible case of duplicity John W. Kline alleged that his coin shop was robbed in 1871 on February 2, and about $600.00 in coins and medals were stolen. One wonders if this was a false insurance claim by the fox of fraud. He had two more coin auction at Bangs in 1871, the first on April 8, 1871, comprised of 310 lots, and realizing $180.52 (average $0.58.23 per coin), and the second consisting of 343 lots on June 12 that realized $238.78 (average $0.69.61 per coin a 20% increase); and also, [*two] at Leavitt & Co., New York, [the first on April 13 * find auction cat. *], and [*the second] on April 21, 1871 comprising 300 lots. Also, that year he was accepting bids for Mason’s 15th and 16th sales. He also sold his 616 lots realize $202.38 (average $0.32.85 per coin, a decrease of nearly 52%) on March 12, 1873 at Bangs, Merwin & Co.; and 1,080 lots on June 8, 1876. In recap we find the first auction of 1855 is of an entirely different order than the subsequent sales and might suggest, though circumstantially, that the first is by someone entirely different than the others that do belong to Mr. & Mrs. Kline. In September 1873 John W. Kline had struck a Masonic medal for the new Masonic Temple dedication services with the image of the Temple on one side and the other the image of the all-seeing eye, square and compass with the words "Dedicated Sept 26th, A.D. 1873" He also issued a store card 1876 in copper, white metal, and silver, using his real name John W. Kline, as a manufacturer of medals, tokens, store cards, and importer and dealer of coins, medals, shells, minerals and curiosities. He retired in December 1880 closing his shop on 13th Street, Philadelphia. Afterwards, he became a sales clerk at Wanamaker’s Grand Depot, Philadelphia. His address at this period is 1528 Cherry Street, Philadelphia. Correspondence sent to John W. Kline at Wanamaker’s Art Department, postmarked Asbury Park, New Jersey, December 13, 1886. Courtesy Lupia Numismatic Library. Although he was thought to have been retired from coins he still conducted business with David Proskey in 1888, discovered from one of Proskey’s business envelopes dated and addressed to Kline offered on the market by Ruby Stamps, San Francisco, California. He also collected stamps and was given a letter by Mason from C. & H. Gloyn, Manchester, England. He died of heart failure in his cousin’s home at 1010 North Fifth Street, Fishtown area of Philadelphia, Philadelphia, on April 6, 1892. He was buried on April 9, 1892 in Woodlands Cemetery, Philadelphia. His estate sold his collection combined with Thomas Ramsden of 1487 lots, and was sold posthumously through the Chapman brothers on June 21,1892, just two and a half months after his demise. His collection of 175 lots was also sold posthumously through the Chapman brothers on September 21,1893. Another collection of 836 lots was also sold by the Chapman brothers on April 13-14, 1896. "KLINE - On the 6th inst., John W. Kline, aged 66 years. The relatives and friends are invited to attend the funeral services, at his cousin's residence, No. 1010 North Fifth street, on Saturday afternoon, at 1 o'clock. Interment at Woodland Cemetery, private." Prune Street was renamed Locust Street in 1867. See Jefferson M. Moak, Philadelphia Street Name Changes. Revised Edition ( 2001). Mason’s Coin and Stamp Collector’s Magazine, Vol. I, No. 1, April (1867) : 3b; No. 3, June (1867) : 21b, 28c; No. 5, August (1867) : 45d; II, No. 5, August (1868) : 46; No. 9-12, December (1868) : 87; III, No. 2, February (1869) : 23 (PHOTO No. 48); No. 3, March (1869) : 33; IV, No. 8, August (1870) : 129; V, No. 3, March (1871) : 48; V, No. 5, May (1871) :79; “Sale of the Elliot Numismatic Collection,” (Kline accepting bids for Mason’s 15th sale), V, No. 9, September (1871) : 144; (Kline accepting bids for Mason’s 16th sale), V, No. 11, November (1871) : 172; Mason’s Coin Collector’s Herald, Vol. I, No. 1, June (1879) : 7b; “Sale of the Smith Cabinet,” (Mason), II, No. 3, December (1880) : 18c-19a, 22d; II, No. 3, December (1880) : 21c; Mason’s Coin Collector’s Magazine, Vol. I, No. 6, November (1884) : 61 XIII, No. 1, June (1890) : 12.